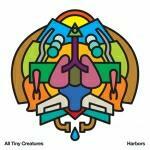 All Tiny Creatues - "Harbors"
Ahhhh... this is a very mellow album with a clean sound that puts a tender smile on my face with its beautiful child-like simplicity. Substitute the female voices for male vocalists and you might have something comparable at times to Stereolab. Some tunes might put one in mind of the pre-New Age-y melodic purity of certain Neu! tracks. Or how does "Dusseldorf krautrock meets the Beach Boys" strike you? Whatever, this might well be my favorite album of year. Holography is a pretty opener, men singing boyishly a wordless "ooh-ah-ooooh" melody, guitars interweave sweet harmonizing lines with delicate backwards-fx ala Michael Rother. An Iris - what does this remind me of... perhaps not even something in my collection, could be some long-forgotten pop tune from the '80s. Cargo Maps has bass-riffing that is thoroughly enjoyable before taking a turn towards a classic catchy-as-anything "uh-uh-uh-uh-uh-uh-ah!ah!ah!ah!" outro. The album does sag a bit in the middle with some blandish tunes in keys that I don't care for. Breathing Set, however, stands apart as a pleasant tune with a driving rhythm and more soulful wordless wailing; I'm not sure whose is the dominant voice on this album but he has a strained higher register that is wide-eyed and endearing. Reservoirs is a slow luscious spaced-out groove with shimmery keys and more "ooh"s and "aah"s. Tine Feature is yet another fine teacher of the genre. I was absolutely mesmerized by the wistful pleasure of closer Plankton March, these mellifluous voicings take me all the way to heaven on a cool breeze... ends too soon - must replay. Recommended if you dig the likes of the above-mentioned artists as well as Yo La Tengo, The Early Years, Octopus Project, etc.